Containing 20 grams of protein and less than 6 grams of total carbohydrates per bottle, Smart Protein Shake is the perfect on-the-go snack to help deliver quality protein into your performance-driven lifestyle. PhD Smart Protein Shake can be consumed at any time of the day and is best served chilled. Shake well and enjoy as part of a balanced diet and healthy lifestyle. Water, Skimmed Milk, Cream (Milk), Milk Protein, Flavouring, Stabilisers (Cellulose Gel, Cellulose Gum, Carrageenan), Sweetener (Sucralose), Colour (Lycopene). 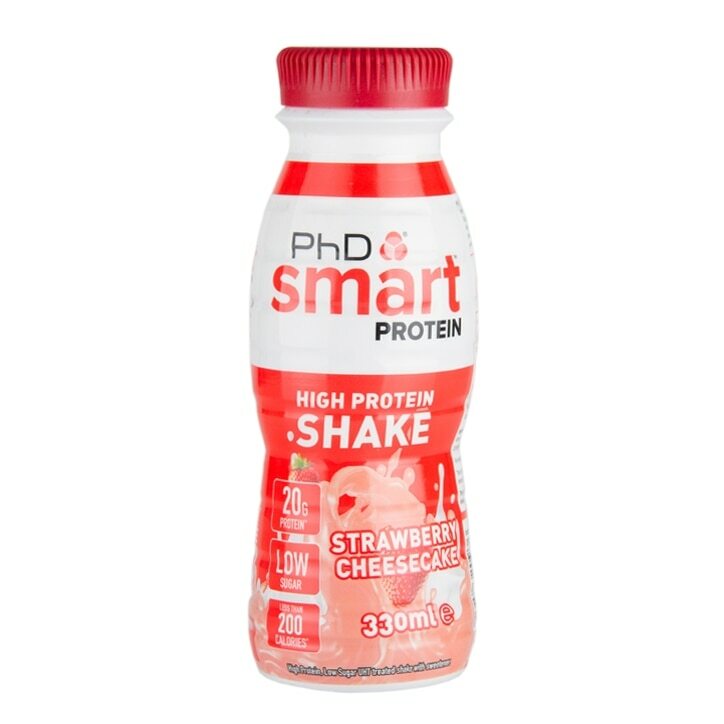 PhD Smart Protein Shake Strawberry Cheesecake is rated 5.0 out of 5 by 1. Rated 5 out of 5 by Carron from Great tasting! A good grab & go choice when your in a rush! would buy again.